Please note that the content of this book primarily consists of articles available from Wikipedia or other free sources online. 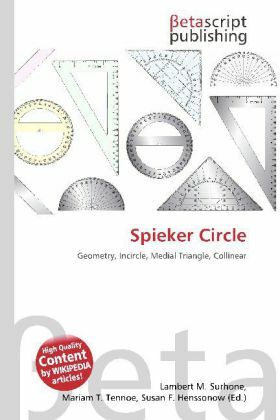 In geometry, the incircle of the medial triangle of a triangle ABC is the Spieker circle. Its center, the Spieker center, is the center of mass of the boundary of triangle ABC as well as being the incenter of the medial triangle. The Spieker center (X10 according to Kimberling''s enumeration) is collinear with the incenter (X1), centroid (X2), and Nagel point (X8). The medial triangle of a triangle ABC is the triangle with vertices at the midpoints of the sides AB, AC and BC of triangle ABC. The medial triangle can also be viewed as the image of triangle ABC transformed by a homothety centered at the centroid with ratio -1/2. Hence, the medial triangle is inversely similar and shares the same centroid and medians with triangle ABC.